Additional highlights from IDology’s 2013 Fraud Report: Credit, debit and prepaid card fraud lead the pack but vary by industry; alternatively, organizations feel most prepared to detect and prevent credit, debit and prepaid card fraud; average suspected fraudulent transaction is under $1,000. IDology, a leading provider of on-demand technology solutions that verify an individual’s identity and age for anyone conducting business in a customer-not-present environment, today announced the launch of their 2013 Fraud Report which polled senior executives from IDology’s comprehensive customer base in order to collect and analyze their expertise when it comes to suspected fraud throughout their industry. 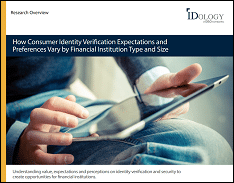 IDology’s 2013 Fraud Survey was distributed and validated through TechValidate, a third party research organization. IDology, Inc. provides real-time technology solutions that verify an individual’s identity and age for anyone conducting business in a consumer-not-present environment to help drive revenue, decrease costs, prevent fraud and meet compliance regulations. Founded in 2003, IDology offers a solution-driven approach to identity verification and fraud prevention that ultimately helps increase customer acquisition and improve customer experience. IDology has developed an innovative and on-demand technology platform that allows customers to control the entire proofing process and provides the flexibility to make configuration changes that are deployed automatically – without having to rely on internal IT resources or IDology’s customer service – so customers can stay ahead of the fraud landscape while maintaining compliance. For more information, visit http://www.IDology.com or call 866-520-1234.